l have yet to meet any sane person who wants to work a generic office job, wear taught ties and suit jackets for eight hours a day, sit in broken adjustable chairs, and sniff paper stacks inside gray partitions. 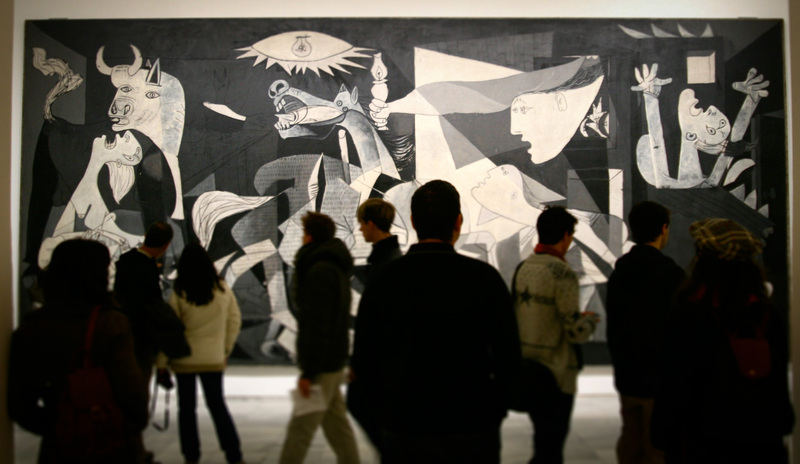 Most people would much rather start that music or standup career, paint their first Guernica, be the one to discover a cure for cancer, or go outside and fly a drone. Who wouldn’t prefer to work for themselves? That way you can wear what you want, work when and where you want, and never answer to a stodgy superior. Should most of us have our way, the word “boss” will one day disappear from the business lexicon. Naturally, colleges that are clamoring for larger enrolments cater to this sensibility by offering majors with hopeful titles like entrepreneurship. But job candidates should know, today’s employers aren’t responsible for this state of affairs. They aren’t the ones opposed to self-expression in the workplace. Clients are. The average client wants to hire someone who says “yes” a lot. They want the product they had in mind before they even hired the company, and they don’t want any surprises in the process of creation, delivery, or usage, unless they completely understand the change. The client prefers that the product’s creator or supplier not give them any ulcers. When the customer looks across the desk and their doctor, contractor, or watchmaker appears conservative, unthreatening, says “yes,” and doesn’t attempt to challenge opinions, the customer is happy. As this desire for self-satisfaction reflects the demeanor of most customers, business owners make sure they reflect these desires, and they look for conservatism and flexibility, chameleon-like qualities, when it comes to hiring an employee who will represent their brand. For a college graduate who may have endured twenty-one years of being told they are special and unique, searching for that first professional position in this context may come as a shock. Figuring out how to subvert your personality to the employer’s desires can be difficult. While the first step might be hiring a professional to craft an impressive resume, a resume can only take you so far, maybe only as far as a phone call. The interview process is the next obstacle and requires additional knowledge and some well-honed interviewing skills, many of which can only be learned through hard experience. Still, here I will attempt to share some of my own experience so that young job candidates might benefit from my numerous mistakes. As you will have rehearsed all of your answers, you know that giving cogent responses was the easy part. Know too that you need to affect a number of behaviors. For instance, be polite while using a calm, professional, and upbeat tone. Don’t stumble in your speech but maintain a fluid stream of short and concise answers. Should you do this and respond to the recruiter’s satisfaction, you may be called in for the first official interview. When this happens, get the name of the person you’ll be interviewing with, the time, address, directions to the office, and thank the recruiter for his or her original and thought-provoking questions. 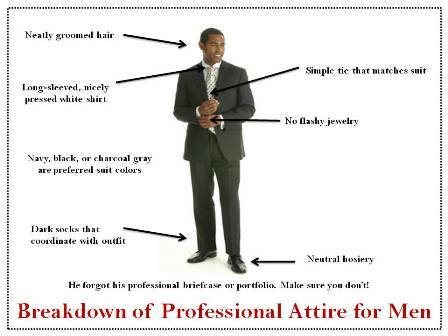 Conservative business attire should be worn at no less than 300 dpi. 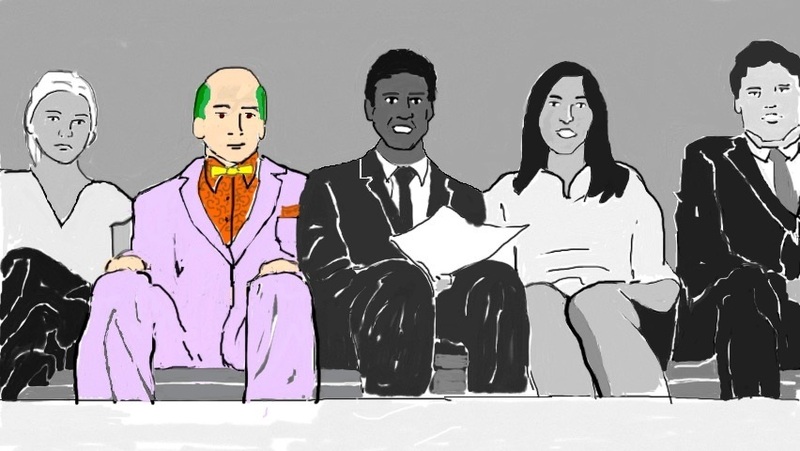 Not many candidates know this, but the next step of the evaluation process happens in the office lobby during your wait to meet the interviewer or interviewers. As the employer wants to know as much about you as he or she can, some have developed a form of “pre-interview interview” or “lobby interview.” While the human resources recruiter has developed the form—listing such items as applicant etiquette, interest in small talk, gesturing ticks, body language, and overall patience—the evaluation will be handled by the office receptionist while you wait. Meanwhile, the recruiter and “person with the power to hire you” will likely be hanging out in the conference room watching The Price is Right. The first item the receptionist will include in the lobby interview is whether or not you called for directions to the office ten minutes before the interview was scheduled to begin. Should you do so, the employer is warned that you did not prepare as you should and may not be one who prepares when you are on the job. Taking a few hours over the weekend to make a test run to the office just to see how long the drive would take might save you much grief. You should also know, navigational apps can be downloaded to cell phones for free, and finding office parks in remote locations is one of a navigational app’s best uses. Failure to use these apps and arrive at interviews on time, much like the failure to learn esoteric computer programs, will chase you out of the candidate pool. When you arrive at the office, the receptionist will note the time. Early arrivals gain more points than late ones. The receptionist will also wait for a polite hello, directed not only at himself but also toward any staff member who happens to pass through the lobby. Pass-throughs were likely scheduled beforehand. The receptionist will also observe the candidate’s posture. Hunched shoulders indicate inexplicable shame or guilt; hands on hips indicate a possible superhero complex. Crowding in to the listener while talking suggests a desire to dominate; maintaining too much distance from the listener suggests a strong desire to go home. Flashy hand gestures may demonstrate that a career on the stage should have been your true calling; no hand gestures may demonstrate that you would prefer a career as a totem pole. And toes pointed in indicate shyness; toes pointed out indicate extroversion. All of these traits will be noted in the receptionist’s report. After the receptionist offers, you should decline all soft drinks, coffee, or snacks, understanding that this would cost the company extra money or could result in embarrassing spills. Alternatively, if you are applying for a leadership role and would like to demonstrate fearlessness in the face of drinking a beverage that might contribute to your stress level in a stressful situation, accept the beverage. Taking treats might also signal that you know how to enjoy yourself and that could be part of the unwritten job description, as clients often enjoy working with people who enjoy life: playing golf or tennis, sharing vacations in exotic locations, or receiving large turkey baskets at Thanksgiving. …business owners…look for conservatism and flexibility, chameleon-like qualities, when it comes to hiring an employee who will represent their brand. Before the receptionist offers you a seat, he will ask you to fill out the company’s standard application. Yes, the company already received your resume but filling out another application tests your patience, and the firm wants to know if you have a short fuse. As the clipboard and application are proffered, accept this tedious task with aplomb. A positive attitude is crucial, as new employees will do lots of tedious and unnecessary work and are expected to do so with an unflinching and buoyant nature. As you fill out this application, the receptionist will sit behind his desk and use the time to critique your appearance. For clothing, you should have put away the sweatpants and workout gear, the skinny jeans and ironic tees. Young men should arrive for the interview well rested, with a new haircut and a mild hint of cologne. Makeup residue, hair dyes, or chips of black nail polish should have been removed. For clothing, visit Brooks Brothers and buy a white shirt, dark-colored suit, striped tie, matching non-white socks, and leather shoes. Women should avoid heavy makeup and overpowering applications of perfume as well. Visit Ann Taylor and purchase a Chanel business jacket to be paired with a conservative blouse, necklace, long creased slacks or skirt cut at knee length. Medium height heels are sensible. Both sexes must wear deodorant. All signs of eyebrow, lip, ear, and tongue piercings should be filled with wax or wood putty if possible. Once you’ve finished the job application, be prepared to wait. The lobby’s coffee table is likely stocked with magazines and this is your next test. There will be an equal number of entertainment magazines, publications that have nothing to do with the business, and trade magazines, publications that have everything to do with the business. Be careful which ones you pick up. Most employers would prefer hiring workers who read trade publications and who seem interested in their profession. Even if you aren’t interested, hold up the trade publication and pretend to read it. The receptionist will take note. Whatever you do, don’t turn on your cell phone and start flicking through Twitter or Instagram. Don’t give the impression that you’re a social media junky and will bring this preoccupation into the office should you be hired. Your Twittering will be recorded, and you will not be hired. 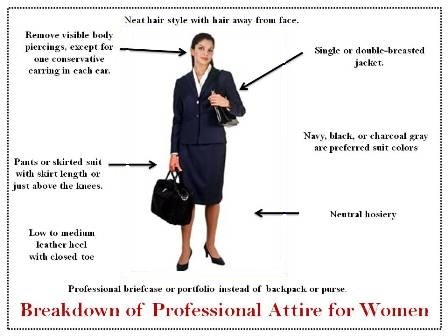 St. Bonaventure University career counselors recommend carrying briefcases to avoid fidgeting with cuffs. A few other miscellaneous things not to do: Don’t check your watch constantly, don’t grimace because you didn’t go to the bathroom beforehand and don’t know if there will be enough time to go now, and don’t ask about parking validation or when the meters expire. Maintain the appearance of self-reliance and take care of these items beforehand. And do not, I repeat do not, walk up to the reception desk, lean your elbows heavily on the desktop, and remark with a grin that you know you are being evaluated at that very moment. Don’t ask the receptionist if he enjoys doing evaluations because it gives him a break from the mundane tasks of answering phones, opening mail, and preparing packages for the messenger. Do be aware that every step in the job search process is an opportunity for evaluation and that you can be eliminated at any time, even while sitting in a lobby. No expression or gesture can be overlooked. Every effort you make should be calculated to win the position. Be a chameleon, be flexible, keep your eye on the paycheck prize and benefits package and know that pleasing the job interviewers, whether receptionist or hiring manager, will make the employer aware that you will be able to please the company’s clients. Some candidates may choose to ignore all of this advice and develop a brand personality that veers away from dark blue suits and sensible shoes, handshakes and thank yous. Perhaps there are employers who are looking for such people. Rather than a chameleon that mirrors the client’s desires, these employers might want a brand representative that offers a product and a personality, take it or leave it. But the chances of finding employers and clients like this are rare. You are more likely to be hired if you stick to reflecting the employer’s and client’s desires, not projecting your own. As entertaining and fun as it is to be an individualist, candidates who choose to “be themselves” do so at their own peril and may be in for a tough time in the job search. When employers turn these nonconformists away, they rarely feel bad about doing so. Should you have developed your own brand, my suggestion is to put your entrepreneurial skills, and your college degree in entrepreneurship, to good use right away. Stop wasting your time trying to get a job from someone else, and start working up your business plan to raise capital from willing investors. The sooner you do so, the better off you’ll be. But before you ask potential investors for money, do plenty of research on the type of people these investors like to work with. Obtaining their trust and money may have a lot to do with how well you perform when they call you in for an interview. This entry was posted in Business Communication, Satire, Uncategorized and tagged benefit package, body language, boss, brand, employer, entrepreneur, gesture, human resources, interview, lobby, person with the power to hire, receptionist, recruiter, waiting room. Bookmark the permalink. Hey Dave, perhaps bring your own snacks and pass them out. After all, it’s all about what you can do for them.